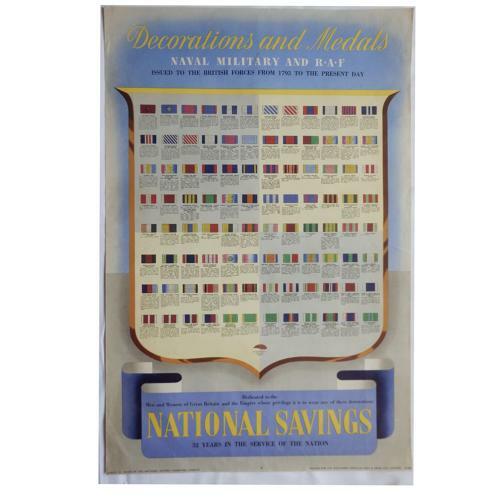 National Savings poster, 'Decorations and Medals - Naval Military & R.A.F issued to the British Forces from 1793 to the Present Day". H.M.F.P. 53 Issued by the National Savings Committee, London and printed for H.M. Stationary Office by Fosh & Cross Ltd. London. Circa 1948. Illustrated with the medal ribbons and dedicated to the men and women of Great Britain and the Empire whose privilege it is to wear any of these decorations. Includes all the well known medals including the Aircrew Europe star, DFC AFC, DFM, Victoria Cross etc. Paper, approximately 49 x 75cm. Minor creasing and wear but in very good to excellent overall condition. Stock code BO4360.